Weekly overview: 43, 44,45-46, 47, 48-49, 50-51, 52-53. Another broad selection of topics for the 2nd week of January 2019 and a range of scores, including two contributions that were unable to be given a mark. No single contribution stood out as far as score, but 'vlemon's submission did receive a healthy number of comments. This analysis focused on recent 'Steemit' statistics and the engagement shows that people are keen to see how the flagship interface for the Steem blockchain is holding up during the cryptocurrency bear market. Two un-scorable contributions is uncommon for the Analysis category at utopian-io. Both submissions however were not related to open source projects, even though the work on both was of good quality, hence the mark of 0 for each. Unfortunately, the post is not in the scope of Utopian, since Tasteem is currently not an open source project. The reviewer gave positive feedback on both contributions, and included the above notes to clarify why the the submissions were not suitable. 'dalz', the contributor of the un-scored 'Tasteem 2018' did however submit two further contributions which were scored. These formed part of a collection of analyses this account has been working on in recent times, covering a wide selection of metrics for projects for the whole of 2018. The aim of this section is to represent the current weeks activity along with a recent set of data. The current data span covers the previous 16 weeks. An average score of 48.4 this week is well below the 16 week average of 70.55 - Two unscored contributions having quite an impact on the average. 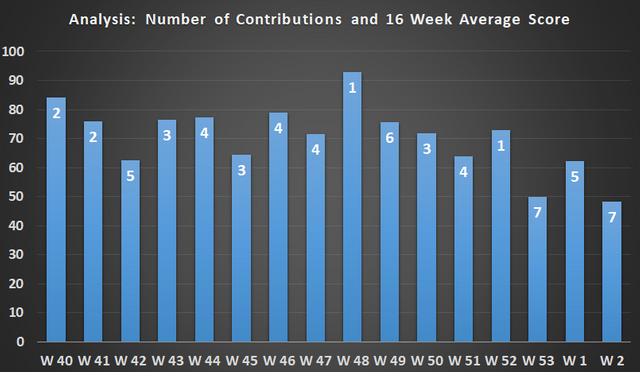 7 contributions for the 2nd week in January is well above the 16 week average of 3.8. The previous three weeks have seen a total of 19 contributions - much better than prior to Christmas 2018. Contributions that did not receive a score are not included in the chart above. 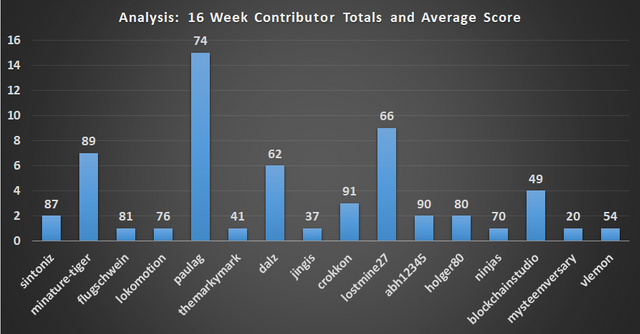 Nine contributors have an average contribution score of 70 or above and seven are below this score, over the past 16 weeks. 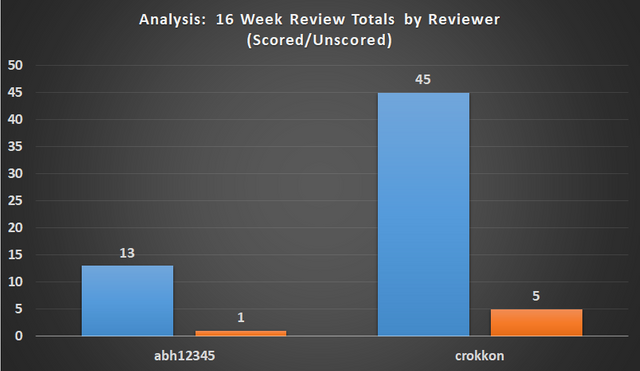 Two reviewers assessed all 58 contributions that received a score in the past 16 weeks. Six contributions have not been scored during this period. Over the past couple of weeks, there have been a handful of contributions that have not been eligible for a score. The reasons for this are not the lacking quality of the analysis, but the fact that the subject area of focus is not an open source project. This is a bit of a shame for the contributor, who may have spent hours on the work, only to find it is out of scope for utopian-io. 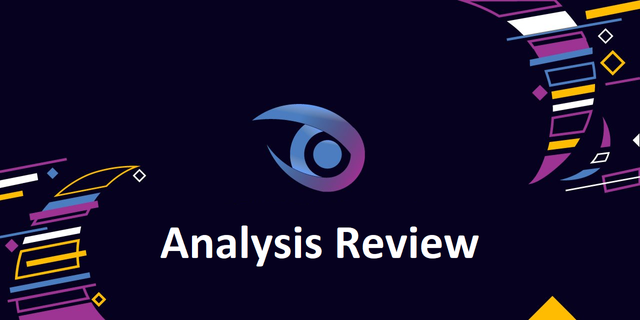 The Analysis team is available for contact in the utopian-io discord, and also via our blogs. We would like to be able to give every contribution the opportunity to be scored, and welcome conversation from contributors who have an idea of a piece of work they are thinking about submitting. That's all for this week, thanks for reading. Thanks for the weekly report. As usual, the report is informative, and all data are well described. It's great that the category continues to receive a decent amount of contributions every week. I hope the quality and numbers continue to grow. Also, I appreciate your work and @crokkon's consistency. You guys are wonderful! Your UA account score is currently 6.813 which ranks you at #104 across all Steem accounts. In our last Algorithmic Curation Round, consisting of 233 contributions, your post is ranked at #74.